“If you’re 25 years old or younger, you have never felt this cold before,” said CNN meteorologist Tom Sater with regards to the blood-chilling ‘snow’ effects of Winter Storm Jayden, which is spreading into the Northeast and the South from the Midwest of the United States. 75% of the continental US population, which is equal to some 220 million people, will have to grapple with below-the-freezing-point temperatures through this week. The news about the harsh impact of Winter Storm Jayden is being reported from all quarters; the worst being the reporting of two deaths from the chilling onslaughts of the storm – one death in Minnesota and the other in Illinois. The Midwest US states, including parts of Colorado, Michigan and Wisconsin have been breathing under more than 10 inches of snow from the storm Jayden. Parts of Illinois, Minnesota, Indiana, Iowa and North Dakota have already received 6 inches of snow. So grim is the forecasting about Winter Storm Jayden that parts of the United States, which are used to endure the biting cold weather, are thrown out of the gear to prepare for the worst. The temperature plummeting far below the freezing point has led to the cancellation of hundreds of flights to and from the Midwest US airports, including Denver International Airport. Shutdown is the fate of schools in the Midwest, including Minnesota at the mercy of Jayden. The cancellation of 3500 flights in total, from Monday to Wednesday (tomorrow) has caused travel havoc. Flights to and from Chicago’s Midway International Airport, a major hub for Southwest Airlines have been cancelled. Airlines called off about 160 flights to and from Chicago’s O’Hare International Airport. Leading air ticketing agencies in the US, including IndianEagle.com have been receiving an influx of calls for flight cancellation or rescheduling. Winter Storm Jayden is predicted to break most of the previous records of devastating cold weather across the Midwest and Great Lakes. From Tuesday to Thursday this week, Midwest and Great Lakes will be experiencing a plunge in temperatures to 20-40 degrees below zero. Wind chill may further reduce the temperature to 35-60 degree below the freezing point. “But the deep freeze is just the first half of the story,” CNN meteorologist Dave Hennen said. North Dakota and South Dakota in the Midwest USA are facing ‘blizzard conditions’ which has made traveling not only impossible but precarious. Mississippi and Alabama are likely to come within the ambit of Winter Storm Jayden. 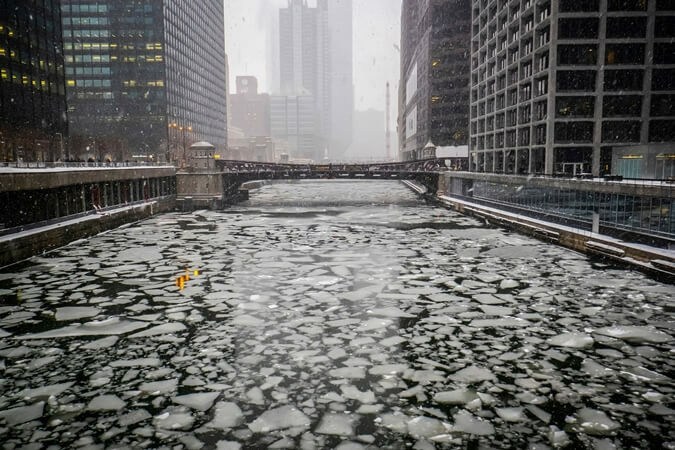 Illinois Governor, JB Pritzker has issued an alert about “potentially historic winter storm that will bring extreme cold to the state,” according to a CNN report. He has already prepared an emergency plan for the residents and the state agencies. The people of Illinois have been issued a directive to protect themselves from frostbite and hypothermia in the wake of Winter Storm Jayden. They are advised to use warming centers in case of snow emergencies. Winter Storm Jayden continues to keep the Great Lake Regions alert. In the south of the US, winter storm warnings have been extended from Georgia to West Virginia to Kentucky. An advisory about the biting cold winter weather has been issued for North Carolina and Tennessee. In the north, New England, upstate New York, New Jersey, Pennsylvania, Delaware, Maryland and Virginia are not exempt to the winter storm warnings and watches. Winter Storm Jayden is likely to dump the greatest amounts of snow across the Northeast, from upstate New York to interior parts of New England, including Boston. The Midwest will be felt colder than Antarctica, and Alaska will be warmer than the shivering Midwest states this week, according to the National Weather Service.